Early in 2017 I experienced a late mid-life storage crisis and began divesting myself of (many) projects that were unlikely to be touched, much less completed in my remaining time on the planet. While this process can be fraught with emotional turmoil as things that, while not terribly valuable, have decades of emotional investment in them as "my stuff", it can add some funds to the part of the budget devoted to fun. 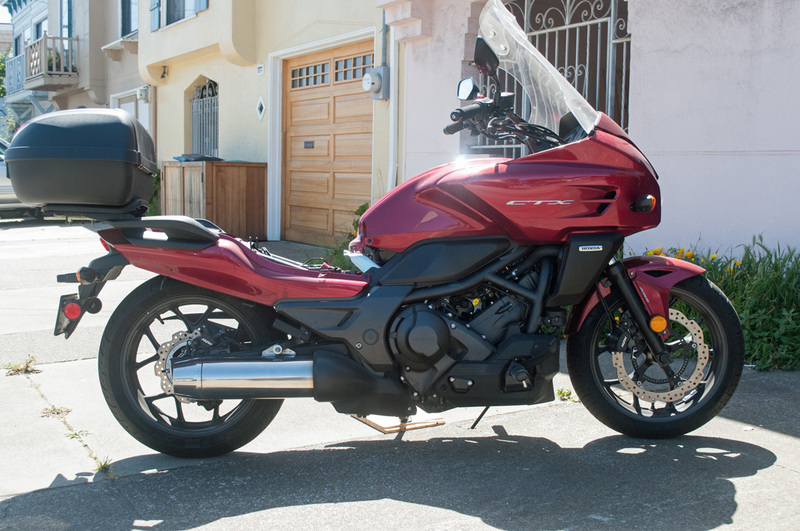 With this boost in discretionary funds I began toying with the idea of buying a fairly modern motorcycle for another attempt at riding on the street. While I've often had street bikes, they have also often never been running, or if running, not ridden because I was more focused on my race bikes. I suspect I have under 3000-4000 total street miles since 1971, divided among a Suzuki TS185, Matchless G80CS, Ducati 350, Ducati 750GT, Cagiva Allazzurra, and (very briefly) a Kawasaki KZ750 four and a second-generation Kawasaki EX250. So buying a nice condition bike that I could go and ride when I wanted seemed somewhat novel. With this idea I then had to figure out what I might want. It proved easier to do this by a process of elimination of what I didn't want. I don't plan to tour or do more than out and back on the same day. I won't be carrying a passenger. I've got no desire for big/fast motorcycles on the street. 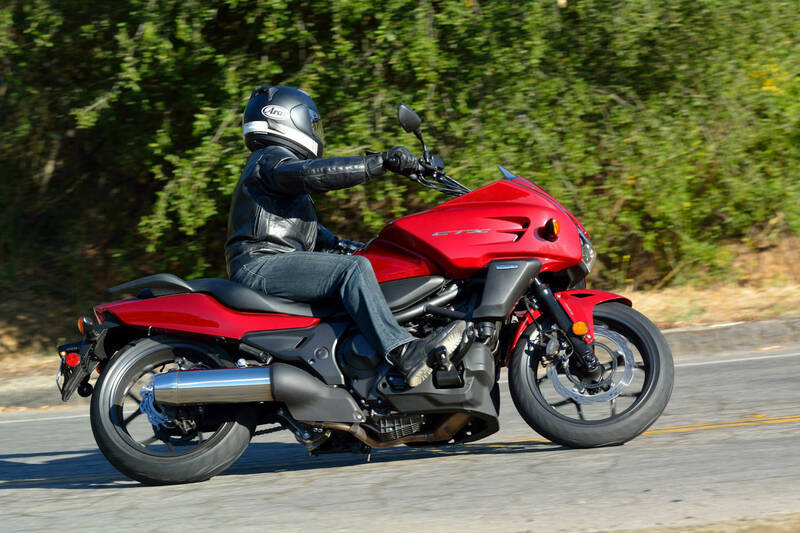 Going fast is much safer/less scary on the race track, and while modern sport bikes are often very tractable why spend money for horsepower (that may result in higher insurance rates) that is largely unused? The EX250 Kawasaki seemed to have plenty of power for "just riding around". 45-50 horsepower seems plenty for a solo rider at reasonably legal speeds who isn't in a tearing hurry to get somewhere. That's about what my Ducati/Cagiva had and they were plenty fast enough for me, even on the track. So that 50ish horsepower upper limit eliminates a lot of potential purchases. Next, what type of bike? Adventure tour street bike with dirt bike styling, a moderately serious dirt capable dual-sport, "universal/standard" or sportbike? From my house in San Francisco it is roughly 60 miles to anywhere that dirt riding is possible so I don't see much need for the dual sport, and I'm not keen about riding off road by myself, or not having some way to get home if I break the bike. Anyway, I've still got some vintage MX and trials project bikes for any dirt riding I want to do. 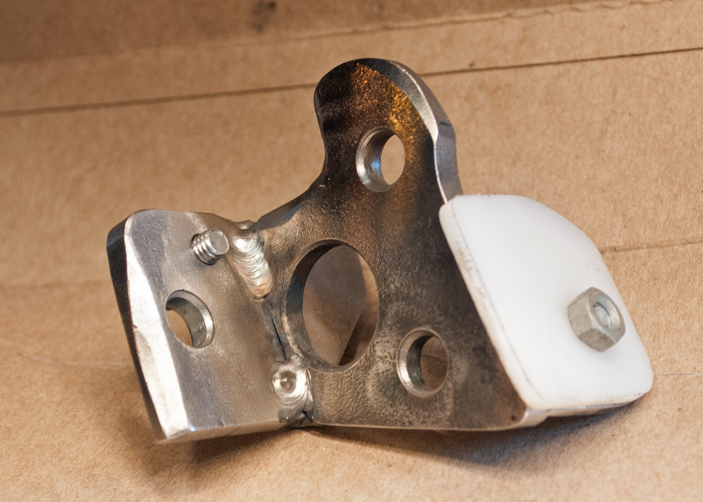 After 40 years of on again/off again road racing I find that I now don't deal well with a road race crouch/clip ons. The bar pressure on my hands makes them numb after a short time, and my neck/shoulders are not very flexible so it is difficult when leaned forwards to get my head up enough to make it easy to see around a corner. There's a fair amount of highway that has to be covered to get to anywhere fun to ride, and that can get tedious on a sport bike. Since I've got dirt bikes I don't see much reason for an ADV-styled bike. If I want a "universal/standard" bike for the street why have it styled like a dirt bike? Front fenders close to the tire do a better job of keeping rain off the rider than a high fender. Hmmm, I seem to have eliminated a lot of potential purchases. So I looked around to see what appeared technically interesting and/or appealing and to my surprise (since a lot of modern motorcycles don't interest me much) I found something. The Honda 670cc parallel twin with the top end leaned forward 62 degrees from vertical. With 45-48 horsepower, a flat torque curve and a 90 degree crankshaft phasing it seems similar to my Ducati twins. Much of my road racing has been done on big singles/twins and I like the power delivery of those engines. The siamesed intake and exhaust systems and undersquare bore/stroke aren't great for big power, but I'm not looking for big power, I'm looking for "sufficient" power delivered in a friendly fashion. A plus is the engine appears to be pretty understressed and it should last a long time. It gets very good fuel economy and with the "not very sporty" engine design valve adjustments are done with screws instead of shims, so it should be fairly easy to maintain. It is also going to be difficult/expensive to get any more power from it, so I think I'll be able to avoid a big/expensive engine modification project that would keep me from riding it. Something that interested me is the Honda Dual Clutch Technology (DCT) transmission that is shifted either by ECU control in Drive or Sport mode or with paddles/buttons in Manual mode. It does add about 10-15 pounds to the engine for the extra clutch and parts, and also MANY pages to the OEM service manual. However it appears to be robust and largely trouble free. I've read comments from many people who have bought the DCT bikes that they like them enough that they have no intention of going back to a manual clutch/shift bike. Some people take the stance that "real motorcyclists" shift for themselves. Good for them, but I don't see them converting their bikes from electric start to kick, or changing the electronic ignition/EFI to points and a carburetor, so that reasoning seems a bit suspect to me. ABS is also available with the DCT and it is reported to work well. There are four versions of the Honda - the NC with ADV styling with the longest suspension travel, the S that is more "standard" on the styling and a little shorter suspension, the CTX that is kind of an odd sport/tour/cruiser design, again with a little less suspension travel, and the Integra which is a motorcycle/scooter cross. The S and Integra are not sold in the USA, so that leaves the NC and CTX. But the NC has the ADV styling which, while it is a reasonably attractive looking bike, doesn't do much for me. That leaves the CTX as the remaining choice with its mild to moderate cruiser styling. I can't say that I've ever had much time for the cruiser/chopper subculture/bikes since taking a spin on a lightly chopped 500 Triumph with sprung hub in 1971. 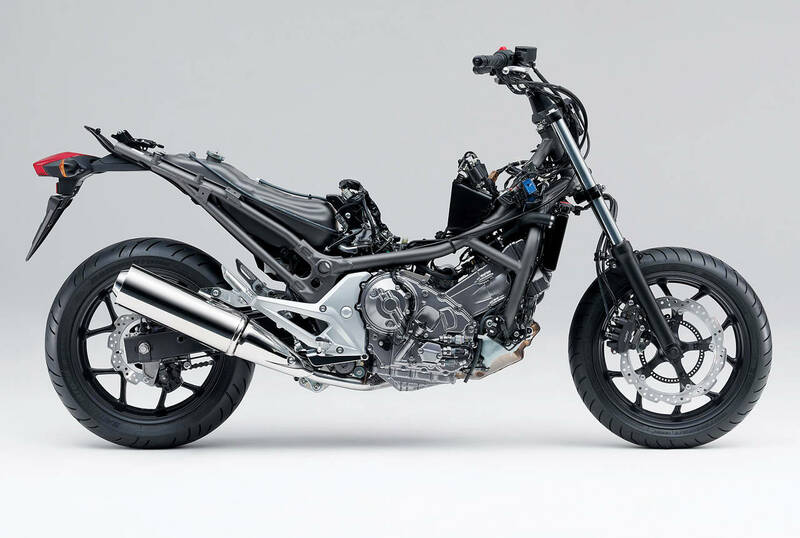 It seemed like a backwards step to make a bike worse handling, more poorly suspended, and with less lean-angle ground clearance. So at first look I was wondering if I had any viable options left. A second look showed I did. One thing I've found nice about the Internet is that I have immediate access to OEM parts books, which has made a lot of my researching of different bikes a great deal easier. Between some information on line and the parts books I learned that the CTX was not as cruiser-ish as it looked. The wheels, brakes, swing arm, rear rocker and links, fork tubes and sliders and the main frame, as well as the powerplant are the same as the NC and S versions. Those bikes get different damper rods/fork springs and somewhat longer/longer travel rear dampers for more suspension travel, but those parts are easily swapped around so if you wanted to make a longer travel CTX or a shorter travel NC there isn't much to change. The wheels are the same size as late 1980s/early 1990s 600/750 sport bikes so there is a good selection of sport tires if those are wanted instead of something biased towards touring. The conventional damper rod forks are 41mm. Both front and rear suspension appear to be "budget level" and lightly sprung but the forks are reported to be much improved by Cartridge Emulators and different springs, and a good mid-level aftermarket damper (and stiffer spring) on the back helps a significant amount. A CTX owner who rides a LOT that I talked to about suspension had emulators and an NC-spec (longer/longer travel) Ohlins installed on his bike and he told me his enjoyment of it went up 10X. Sections of pavement that used to have him slowing by 20mph are now taken in comfort with no speed reduction, and the ride is much more plush but still well controlled. These Hondas make me think of the older Tonti-framed big-block Moto Guzzis. They started with the same basic bike, and then you got to decide how to clothe it -- dress it up as a tourer, sport/tourer, standard or sport but the bike underneath is pretty much the same in any guise. 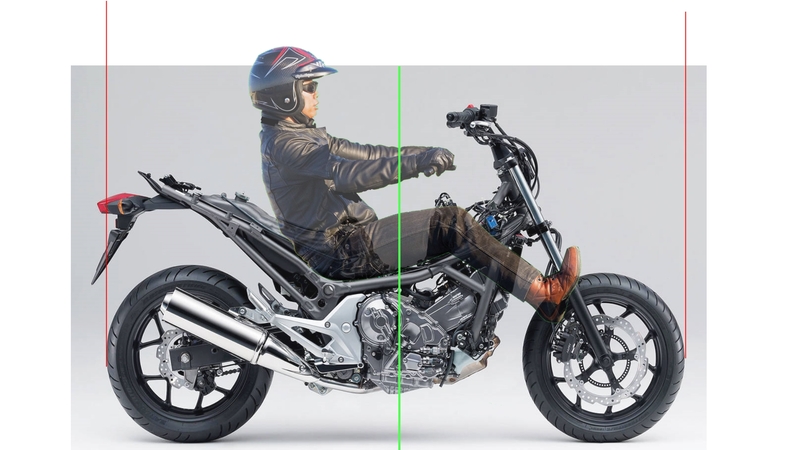 If the Integra with its scooter-style frame is dropped out of the comparison Honda has done the same thing with the NC, S and CTX. The chassis numbers (rake/trail, wheelbase, etc) on the Hondas are certainly in the ball park of the street bikes I've had (and some of them have worked well enough for me on the race track too). I'm looking for a street bike, not a race bike so I don't need something that lets V. Rossi win a MotoGP. That leaves the CTX styling as a last possible sticking point. I have to admit that the more time I've spent looking at photos of them the better I've liked the looks of the bikes. But you might ask "Michael, what about the cruiser riding position?" Ahh yes, what about it? I've followed the Feet Forwards (FF) design concept for several decades and have been slowly working on a track FF project as you can see elsewhere on the website. So if I look at the CTX as a "somewhat FF'd" bike, rather than a cruiser, it becomes more acceptable to me. That may be a spurious distinction, but as long as it works . . . It won't have as low of a seat height (the engine is taller above the output sprocket and being long the rider needs to be above the engine, not behind it) or be as light or as powerful as one of Dan Gurney's Alligator FFs, but it looks to me to have the most potential as a base for an FF of any recent production motorcycle (I'm deliberately excluding the maxi-scootersm some of which have been converted by Royce Creasey). 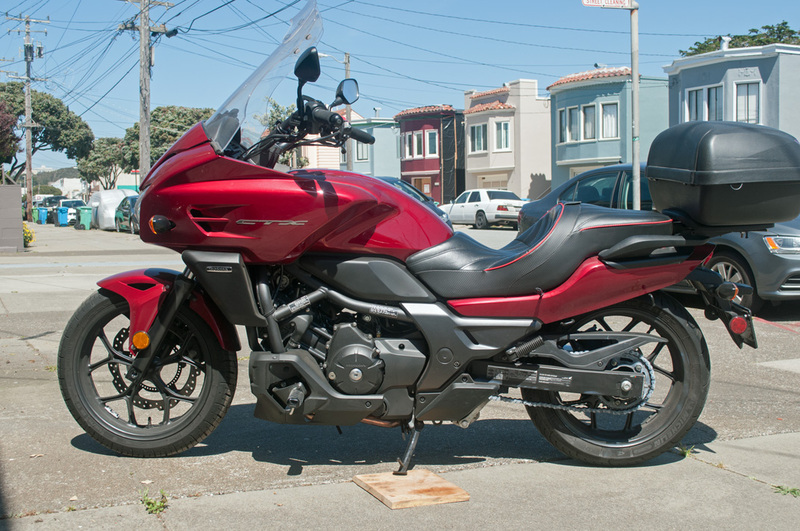 So I'm going to see what I can do to skew the Honda farther towards the FF end of the spectrum. With the shared parts I could have easily started with a DCT/ABS NC if one had come along with lowish mileage at a good price. A CTX or NC with trashed cosmetic panels making the price significantly less expensive would have been very nice, but I didn't see one. Take off the bodywork on the two models and the difference that is least easily changed is the angle of the seat subframe, which on the NC continues up at a steeper angle than the CTX does. A member of the CTX700 forum who lives about 30 miles away mentioned that he had a bike and was going to put it up for sale. He's the original owner and has kept the bike garaged. The price was reasonable and a deal was done. In the space of a couple months I went from "I've got too many projects sitting around costing me money" to "look, I've got a very nice practically new bike that I can actually ride and some space in the garage for it!" So it is a clean, low mileage bike with a few modifications to make it better for commuting. The original owner eventually found he wasn't riding it enough to justify keeping it. He had any service (not that much was needed) done at the dealership where he bought the bike. I could leave it just as it is and ride it around, or at least I think it might be possible to do that. I have trouble leaving motorcycles alone, which is probably why I've had so many of them that didn't run (but a lot of them didn't run when I got them so it hasn't always been totally my fault!). With this bike I'm going to try hard to have as many modifications as possible be of the bolt-on type that don't force the bike into extended non-operational status. I'd like to ensure that I can get out for a ride or two every week. I just got back from my first ride of about 90 minutes on the CTX. The tall Cee Bailey screen height didn't seem bothersome and the screen seems effective, but I still don't like the looks of it. The DCT is very effective for launching away from a stop light. The DCT was fine to ride with. I did some manual shifting and tried both drive and sport modes and doing a manual override while in auto mode, and while they are all different, they were all fine. There's plenty of power for my needs/wants. I've got to adjust the bars/brake lever because the bar is a bit high and the lever low so I was able to use only the finger tips and my hand was getting tired. An adjustable lever may be in order. My thick RR gloves and possibly a thick hand grip may contribute to the issue. The front brake seemed OK but not hugely powerful, maybe that will improve when I can get a better grip on it. The rear brake doesn't seem very effective and there was something that my right ankle wasn't happy about, I don't know if it was the peg position or just an old ankle. The engine feels harsher than I'd expect from a 90 crank with balance shaft, I guess that's the vibes left in for the pseudo H-D experience. But it is mostly noticeable in Drive when the trans is shifting up very early and RPMs are staying very low. I'm not sure if the engine is actually lugging or not, but that is the impression. On the other hand, I doubt that Honda would have the shifting programmed to be so low that the engine was going to be unhappy. Sport mode holds the gear longer and to a higher RPM so I'll have to experiment with staying in S instead of D.
The suspension doesn't seem very good, with a harsh road feel over cracks/ripples and jolting on bigger bumps (recessed man hole covers). Money will definitely get spent to fix that. I'm not sure if it was the Aerostitch suit (which I'd never worn before) combined with my jeans being bunched up, or if there's some corner of the back tank cover and/or a raised spot on the Corbin seat but while I wasn't uncomfortable I could tell that a spot on my upper/inner right thigh was getting some noticeable light pressure. The bike feels very light if doing some swerving back and forth or leaning in slow corners. I'm going to need some parking lot practice, I stopped off in a few and did some circles, and I tried dragging the rear brake a little as I'd seen that mentioned as a technique for a bit more control. The FF riding position was fine, but I think when I come to a stop I'm dropping my left foot straight down from the peg (as normal) except that peg is farther forward so there's less support stability. I'll have to get used to pulling my foot back some. The local Vultus owner stopped by this morning and we had a nice visit. I found the bike very nice to sit on (somewhat lower seat height than the CTX). I liked the OEM back rest a lot, and I think the floorboards were more comfortable and better positioned than the CTX peg. His bike has had the rear brake converted to LH grip lever (he also has a Honda Silverwing maxiscooter) and the foot pedal deleted, and I'm going to order the parts to do that right away as I'm not keen on the position of the rear brake pedal. The Vultus looks a lot better in person than in photos, though it will still help if you like manga/anime styling. 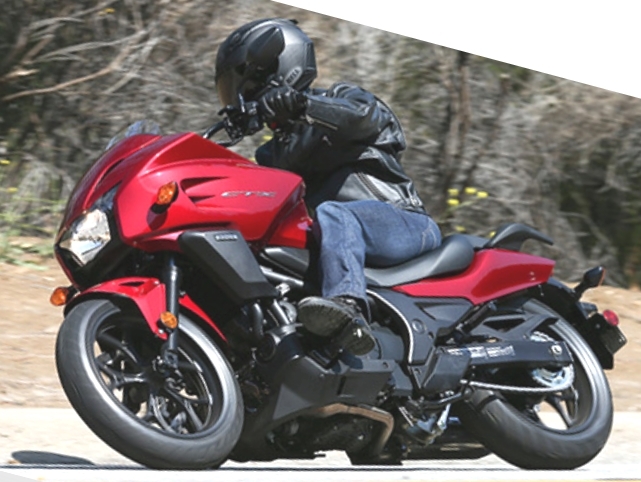 He mentioned his biggest adjustment was getting used to the large offset between the steering stem and handlebar grips making it easy to oversteer a little in slow turns. I may have been experiencing some of that on the CTX. It was strange to be riding on the street and it will take some getting used to. But I've no big complaints about the bike other than the niggles mentioned above, and hopefully after addressing them the next ride will be an improvement. As the plan is implemented I'll edit this section to include the results. The first item on my list is to get more familiar with the bike. I've done a lot of reading on the Honda 670s (I bought both NC and CTX OEM service manuals) and I've collected a lot of photos of the bikes. I like to modify photos (I use the free paint.net program which does most everything I could want to do, though I often do some enhancement first in Photoshop Elements) to investigate "what if" scenarios. 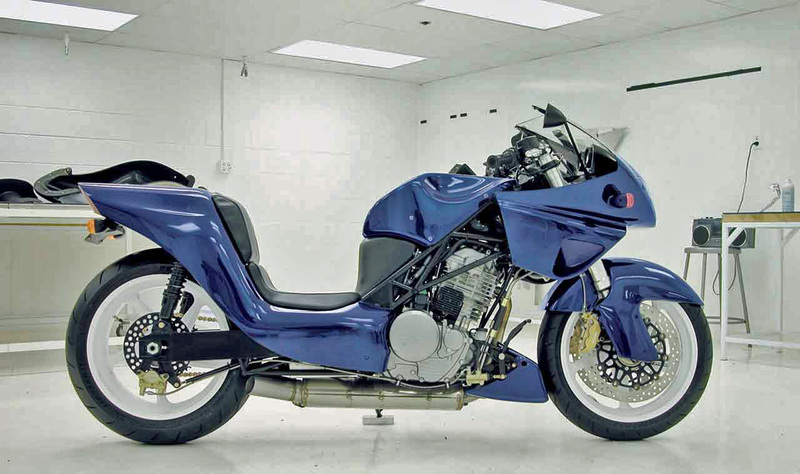 I've found a few photos of the bikes with bodywork removed to expose what is underneath, but some of those have been of the NC which has a different location for the battery, fuel tank, seat mounts, foot rests, etc when compared to the CTX. So removal of the bodywork and getting good side/front/back and detail photos will be part of the familiarization process as will be gathering measurements. Usually I'll put a scale in the photos so I can have a standard dimension to adjust the sizes of the photos to match when mashing them together. I also want to weigh the bike to determine the unladen fore/aft weight distribution with a full fuel load. The NC appears to be slightly biased towards the back, but the CTX fuel tank is in front of the rider instead of behind/below as on the NC so it might be more 50/50 or even slightly front biased. However, once a rider is added all bets are off as the position of a rider that may weigh almost 1/2 of the bike can make a big difference. But being able to determine the center of gravity (CoG) of the bike without rider will be useful information. I don't think my shipping scale is of a high enough capacity to weigh one end of the bike with the rider on board so I may have to get creative. See what parts drag when leaned over and try to make them stop doing that. This may actually be slightly higher in importance. I'm not intending to strafe corners on the public roads but the CTX pegs, and possibly exhaust, look kind of low to me and I suspect one or both may drag at an inopportune time. I'd like to avoid having a tire levered off the ground by something grounding before the tire has run out of grip. I will collapse the suspension to check ground clearance as well as clearances at full suspension extension (droop) and full compression (bump). The goal of making the bike more FF will mean doing whatever can be done to lower the rider's position, and part of that process may include lowering the sprung part of the bike at full bump. 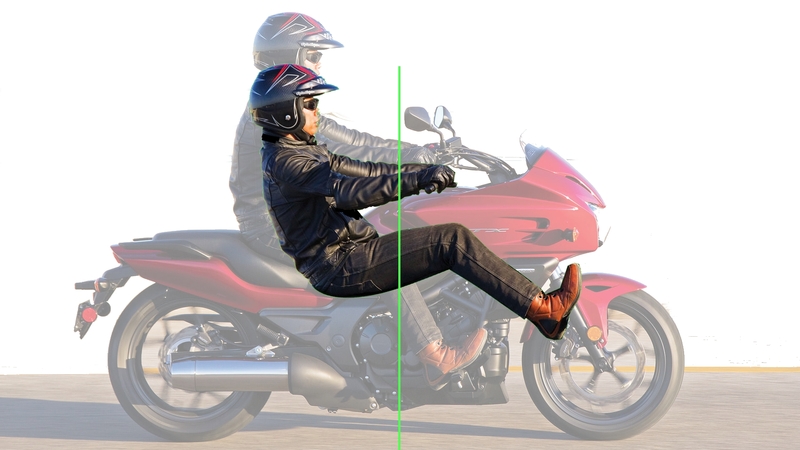 Royce Creasey, who has been one of the leaders in developing the FF concept recommends at least a 45 degree lean angle at full bump and a 55 degree lean angle with the bike at the normal ride height, so I'll use those numbers in the checking process. 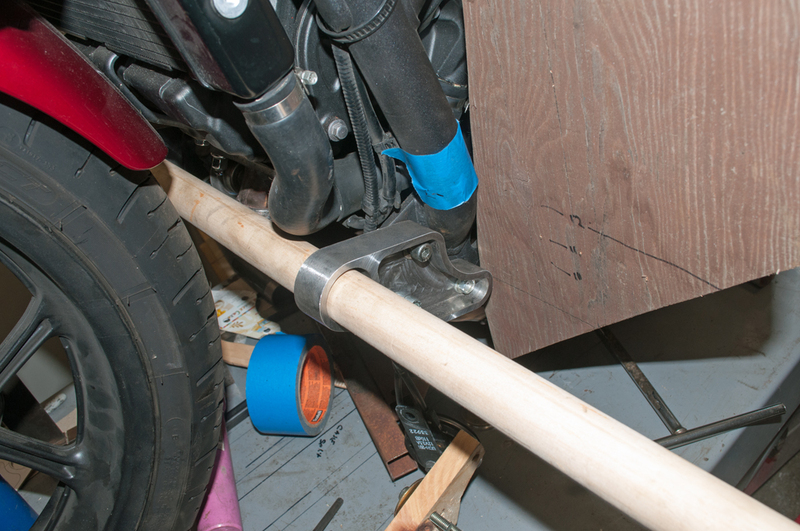 A lean gauge will be a length of plywood held at that angle (this simulates the ground) that is then moved to contact both front and rear tires together. Anything that bumps the plywood before it is up against the tires needs to have something done with it. 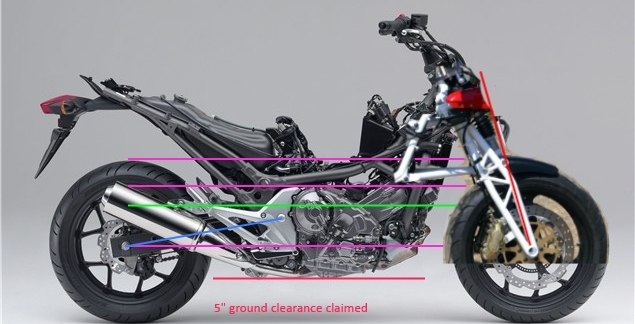 I've read of various people using different length links to lower the back of the bikes an inch or two, but I'd want to run a simulation on the rear suspension before making a change like that. Once the data is collected Tony Foale has some software that gives a lot of output on the action in the suspension. Address the suspension inadequacies. As I mentioned above Honda has had to fit less than top-flight suspension in order to hit their target price. That is a common practice, but it doesn't help the owner much if the suspension is not to their liking. The standard rear damper (a Showa of the de Carbon internal reservoir type, also sometimes called an "inline" or inner piston damper to distinguish it from an external reservoir type) is not adjustable for anything other than spring preload. 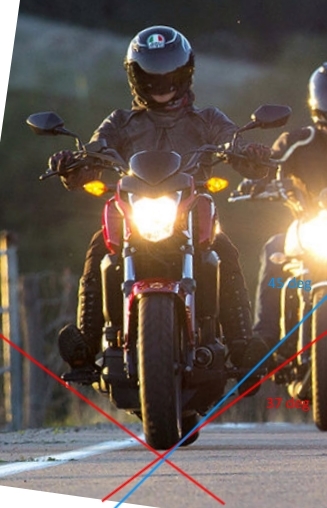 The suspension seems to be aimed at lighter riders as those who are more in the 180+ pound range (I am on the + side of that number) find that they have to add spacers under the spring to be able to preload it enough to have much available bump travel at a normal suspension sag position. The incorporation of the reservoir/floating piston into the body of the damper means that for a given overall length there will be less internal space to allow damper rod movement than if there is an external reservoir, connected either directly to the body of the damper or by a high-pressure capacity hose. Shorter available travel in the damper for a given wheel travel means higher leverages are at work and a stiffer spring must be used for the same wheel rate. It may be that going to an external reservoir will allow a shorter body so length adjustment can be added to the damper (presuming of course that isn't possible with an internal reservoir damper). That could be nice to have for making adjustments to ride height/ground clearance. There are a lot of choices in aftermarket rear dampers so some research will need to be done. A good $600-750 damper seems to be quite adequate for street use, there's probably little justification for going with something suitable for a serious track machine. The front forks are conventional (Right Side Up = RSU) Showa with 41mm diameter tubes and use damper rods and not cartridges. Damper rods have velocity-sensitive orifices that with sudden motions can hydraulic lock, making the suspension harsh. The standard upgrade for this type of fork is the Race Tech Cartridge Emulator which requires enlarging the orifices in the damper rod to disable them for compression damping which is then controlled by the Emulator. Rebound damping is adjusted with fork oil viscosity. The Emulators can be tuned by adjusting the size/quantity of bleed holes or the stiffness/preload of the springs controlling the shim plate, but this does require the fork springs to be removed and the Emulator fished out, modified, and then reversing the disassembly procedure. I've found that having to go through that process makes it very easy for me to install the Emulators and never try to adjust them. There are three cartridge damper conversions that I'm aware of that can be fitted to these forks with some or no modifications. They may have externally adjustable damping for one or both directions. It sounds like they can benefit from some detail modifications which is a bit disappointing for a $6-800 kit. If those modifications include different pistons that can add $150 or so to the conversion. That's quite a big jump in price over the Emulators, but the ability to make adjustments that are never used because of "I don't feel like bothering" issues may make the monetary savings less important if the goal is to optimize the suspension. I have a few other ideas I'm toying with for the front suspension but they are much more involved and might get away from the "keep modifications bolt on and don't make the bike unable to be ridden for an extended period" concept. I'll have to see how they look when I have more data on the bike. Next will be adjusting the ergonomics. 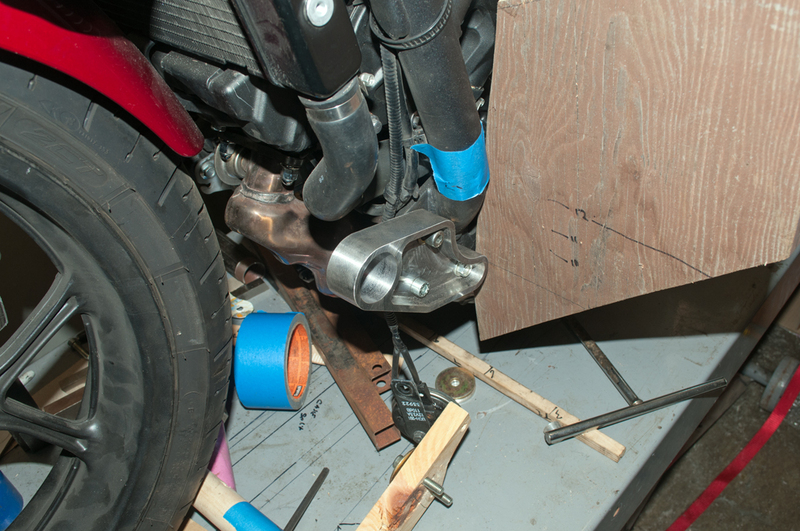 The foot pegs may need to go up to add ground clearance, and I may want to go fore/aft to adjust for my 6' height. The seat surface is much higher than the main frame rails so I'll have to look both at how much it might be lowered and also consider making a shorter fuel tank (or relocating it behind the rider as on the NC700) to allow the rider to go forward if needed for a better rider plus vehicle weight distribution. 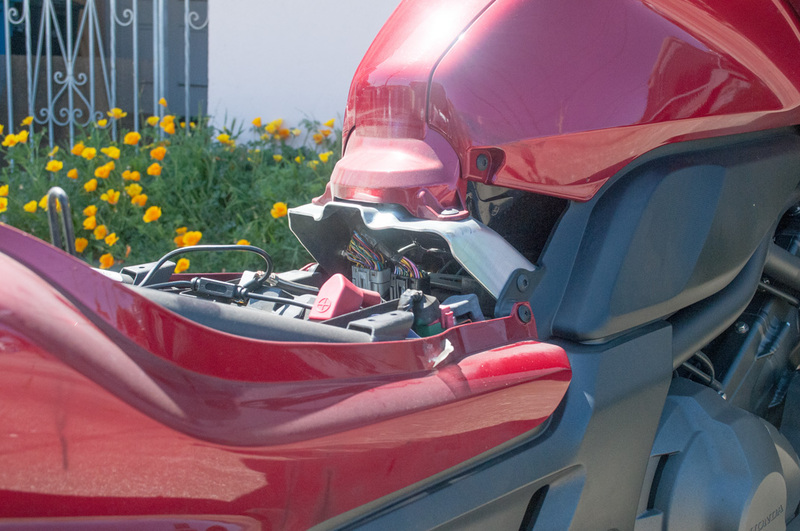 If the rider doesn't go forward a rearward secondary steering head is probably in order to get rid of the "tiller" style handlebars required by the distance from the seat to the fork crown. I don't know how many of the body panels are just trim pieces that can be left off. It sounds like accessing the air filter on a faired CTX can mean an hour or so of removing a lot of panels and a lot of fasteners for a 5 minute service item. If the trim actually provides some protection or serves some other purpose than I'll leave it in place, but if it is just "there" it may go to a shelf. Another thought I'm toying with is converting the rear brake master cylinder to left hand operation instead of a right foot pedal. 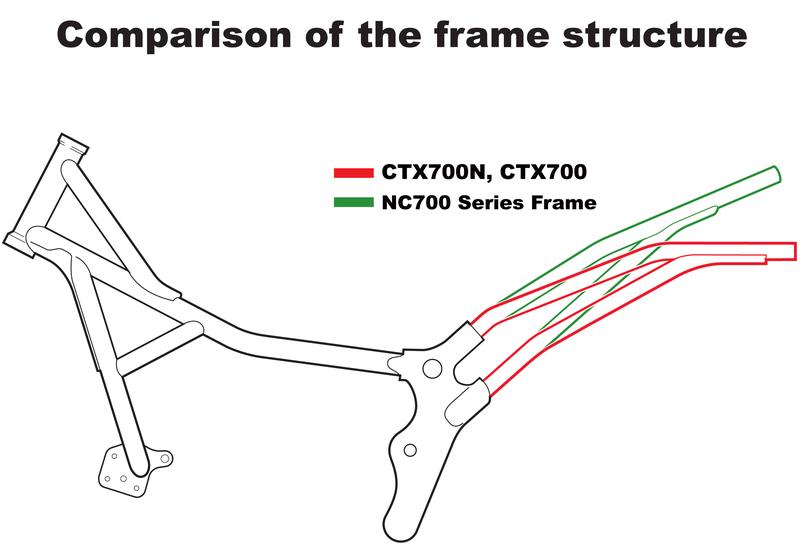 I found some information on doing that on an NM4 Vultus, which is a limited production variant with more changes to the frame. 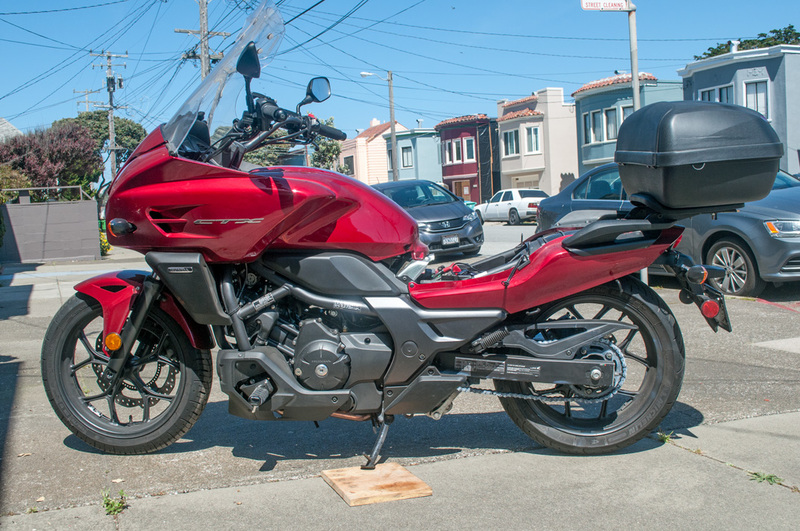 The person used the master cylinder from a Honda Silverwing "big scooter". That part is much less when bought new from Honda than the similar part used on the Integra. Eliminating all foot controls would make it easier to relocate the pegs if/when that is necessary. UPDATE 06 April 2017: the SW master cylinder is on order, as well as an adjustable lever for the front brake master cylinder. But those mods are down the road aways, I can think about them while dealing with the ground clearance and suspension issues. 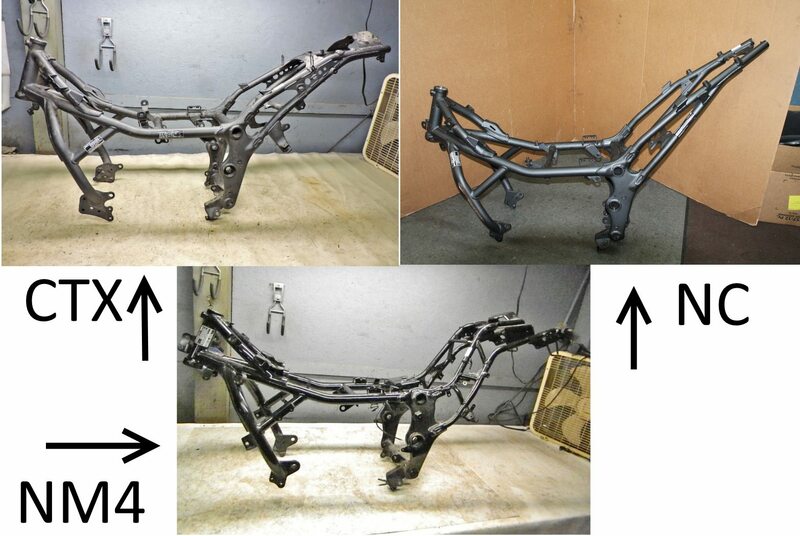 The main frames appear identical, the difference is in the subframe several inches after it leaves the main frame. The 18" seat height of this bike is probably not going to happen with a Honda 670cc twin. Moving the rider on a CTX into a more FF position -- down as well as foward. Note that the NC has the tank to the rear to leave room for the "frunk". The CTX tank is located where the frunk would be. 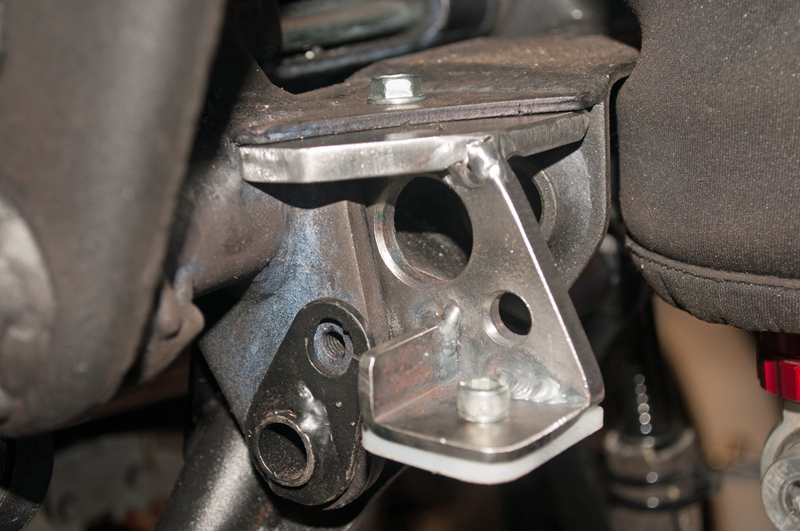 The NC and CTX are similar but for the subframe and detail brackets. The NM4 has a shorter and more raked-out steering head and different subframe. What if the CTX/NC had a Hossack FFE (funny front end)? I recently purchased a Mutazu NC700 center stand for my CTX. It appears to be a close copy of the Honda OEM stand other than they made the hook for one end of the small spring too small (that was adjusted with pliers) and don't supply a section of hose to put over the springs to keep them from scrubbing on the stand. 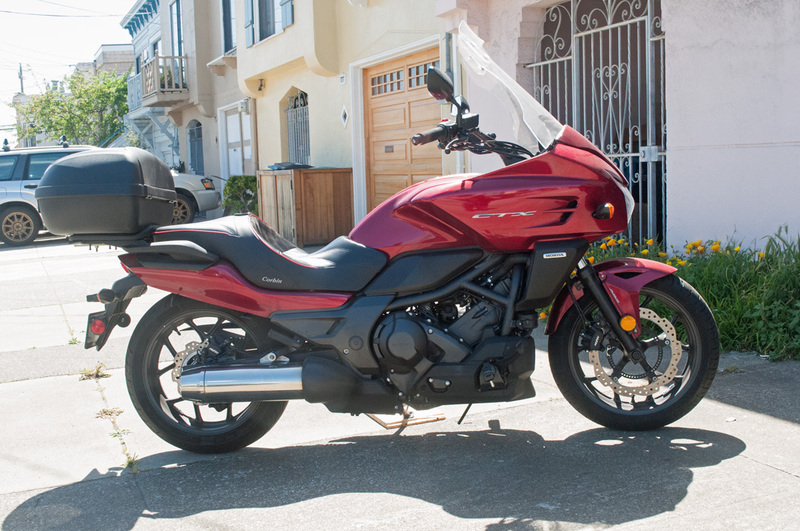 All of the stands, Honda OEM or aftermarket, are for the NC-X or NC-S models which use a rubber foot on the stand against the underside of the muffler on the right side of the bike as a stop. There's a stop sold by a shop in Japan that provides the OEM NC-S stand (shorter height than the longer suspension travel X model) that doesn't look too fancy but they get $40 for it. It is mounted with the M6 bolt that retains the pivot shaft and some people have reported bending of that bolt. I think the problem is that the only thing holding the stop in place is that bolt and many people probably just roll off the stand and let it slam into the stop. I just finished, other than paint (it is too windy outside right now), a more elaborate stop that should eliminate that issue. I had some bits of .25" HR steel plate on hand that I used along with a piece of .125" angle and some .125" UHMW-PE sheet. I'd noticed there were some 6 mm fixturing holes in the lower damper mount plates so I shaped and tapped a piece of plate to be clamped to the underside of the mount, then welded a vertical piece of plate to that. The bottom of that (with the plastic underneath) is what contacts the reinforcing rib on the stand so all loads are fed through those plates straight into the frame plate. 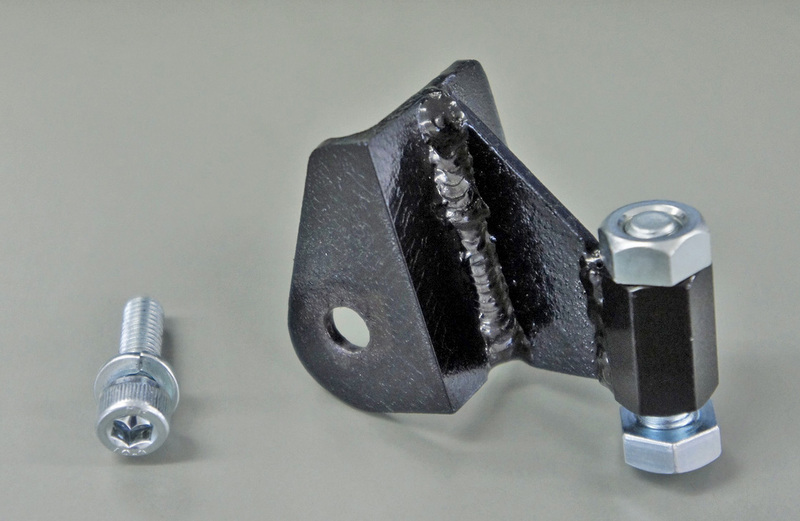 The bolt only acts to keep the stop from falling on the ground when the stand is down, the rest of the time the stop is held in place by the stand. The retaining screw for the pivot shaft is not used to retain the stop. 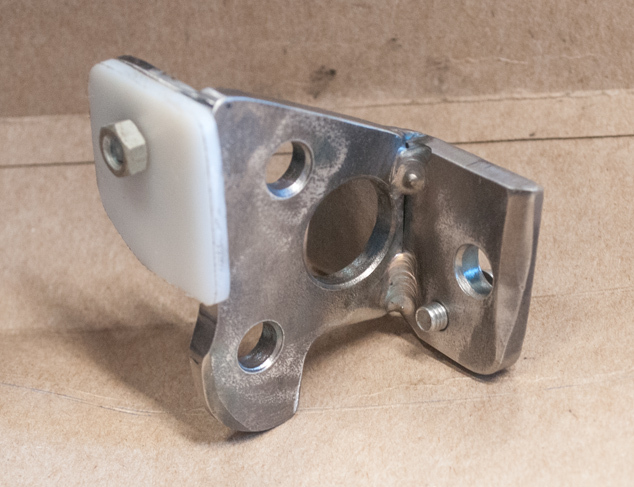 I drilled a couple of token lightening holes, and the big one is so the pivot bolt for the suspension rocker can be accessed without removing the stop. It no doubt is overkill but I think it should be bulletproof (though a bit on the heavy side). If anyone wants to base their own home-brew stop on what I came up with be my guest. I made some progress on the project recently. The bike is currently sitting with the suspension collapsed and I made 45 degree lean angle gauges that are bolted to the frame to make it easier to stay within those boundaries. 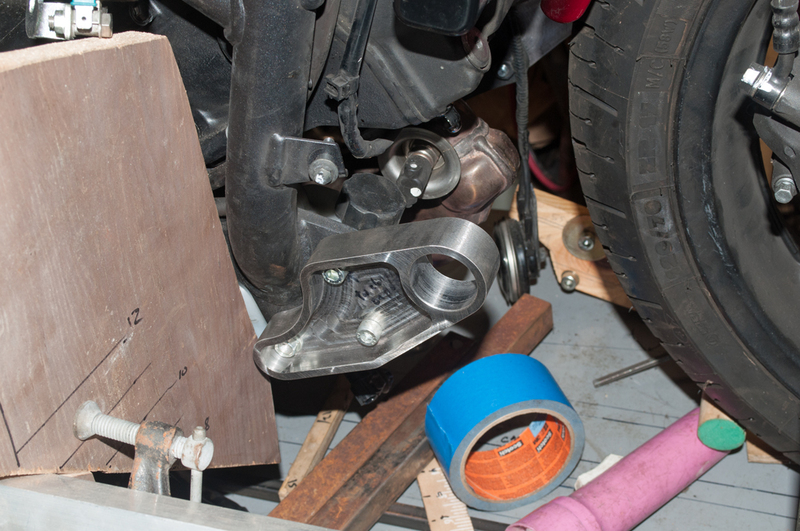 I've machined the base mounts for the footbox subframe which bolt on to the plates at the bottom of the front down tubes, which is where the lower engine mount and the OEM footpegs attach. 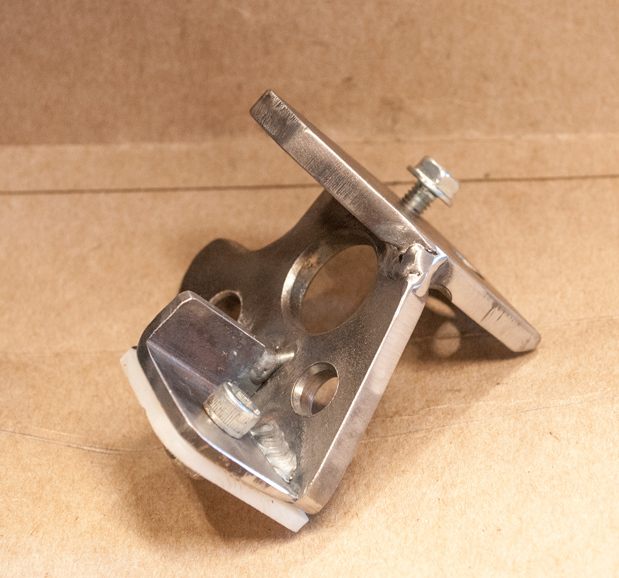 I intend for the footboxes to provide a reasonable amount of protection for the rider's feet so the mounting plates are made with strength, not elegant lightness, as the goal since they will be the main attachment to the frame. Left footbox mounting plate. The plate is sized for 1.375" tube, the dowel shown is 1.25" diameter. The 45 degree lean angle gauge is visible and the front suspension is compressed. Left footbox mounting plate. The 45 degree lean angle gauge is visible and the front suspension is compressed. Right footbox mounting plate. The 45 degree lean angle gauge is visible and the front suspension is compressed. That is the catalytic convertor behind it. Peter Verdone's CTX700 project Peter has been improving his CTX700 and documenting the changes on his website. It is well worth reading.